In Muenster and the Muensterland as well as in the near by Rhineland there are numerous Montessori institutions, where the realisation of the Montessori pedagogy (from preschool and primary school to secondary school) can be studied. Montessori Children’s Houses are, for example, in Münster, Emsdetten, Coesfeld, Bocholt and Vreden. The Montessori Primary School in Bocholt has made many experiences within several decades. The Albert-Schweitzer-School in Münster, a Montessori school for learning-disabled children, possesses an international reputation. In many other regions in North Rhine-Westphalia Children’s Houses, primary schools and secondary schools can be found. Some of them have been working successfully with the Montessori pedagogy for a long time, partly at a regional or governmental level, partly in independent sponsorship programs. Nowadays the practical Montessori education in Muenster and in the Muensterland emphasizes the composition and extension of integrated Montessori institutions. Here disabled and non-disabled children live, play and learn together. This model was developed by the paediatrician Prof. Dr. Theodor Hellbrügge in the 1960s in Munich. It attracted a lot of interest and has been copied by various institutions all over Germany and in many other countries of the world including Japan. In Borken there is a complex of Montessori schools which work in this way in all kinds of Montessori institutions from playgroups to secondary schools. In Muenster there is the Montessori Children’s House Pötterhoeck and the Montessori School Münster. 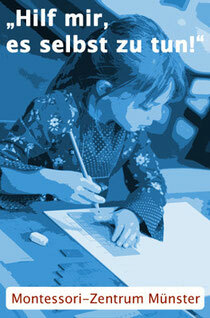 The Montessori pedagogy is especially suitable for integrated purposes. The same applies to the challenge/ task of integrating foreign children and teenagers in German educational institutions within the program “Intercultural Education”.